The impact of this air pollution doesn't just stop at human health. Several of the gases that cause air pollution also have greenhouse properties. It’s 6.30 pm in the northern Indian city of Varanasi on a cool January evening. Darkness is yet to fall but visibility already has. The cars on its teeming streets are hard to see from just metres away. But your tongue registers the dust obscuring the view. Soon, your skin feels the coarse particles that make up this dust. There is enough of it here, according to 2018 World Health Organization (WHO) data, to classify Prime Minister Narendra Modi’s parliamentary constituency as one of the cities with the most polluted air on the planet. 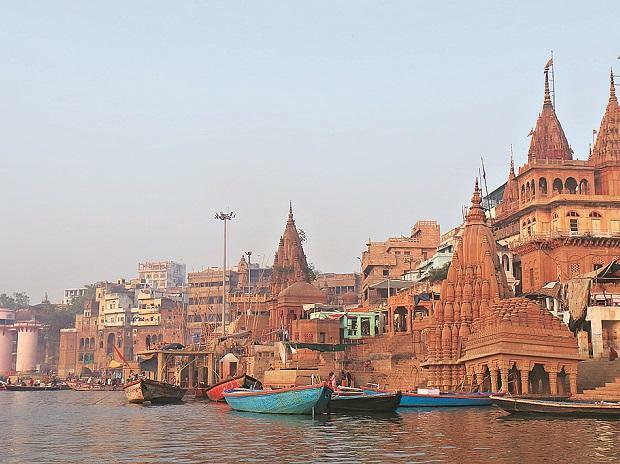 Home to 1.2 million people, Varanasi, sprawled along the banks of India’s holiest river, the Ganga, has since 2016 frequently overtaken India’s national capital New Delhi in terms of air pollution, according to WHO data. Varanasi is not alone. Home to over 600 million, the Gangetic plain hosts four other cities--Kanpur, Faridabad, Gaya and Patna--that occupy the top five slots in the 2018 WHO list of the world’s most polluted cities, measured for particles that are 2.5 micron in diameter (PM 2.5) or less. These particles are 1/25th the diameter of a human hair. They are known to cause cardiovascular and respiratory diseases, even cancers. India’s cities also occupy 11 of 15 of the slots in WHO’s list of most polluted cities in the world when a larger pollutant--PM 10--is considered. The impact of this air pollution doesn’t just stop at human health. Several of the gases that cause air pollution also have greenhouse properties--they trap the sun’s heat and push up the earth’s temperature, and the latest research implicates these pollutants as changing local and global climate by means still being studied. It does seem, experts said, that temperatures are rising on the Gangetic plain, and the monsoon is becoming more uncertain. While several gases--such as carbon dioxide (CO2), methane and nitrous oxide--were known to cause warming, it was earlier believed that particulate matter in the air reflects sunlight, causing a cooling effect. Emerging research now indicates otherwise. While some particulates have a cooling effect, others cause an increase in temperature, studies suggest. The year 2018 was the warmest on record for the planet since record keeping began in 1880, according to an assessment by US National Oceanic and Atmospheric Administration (NOAA), the largest repository of climate data in the world. As temperature fluctuations become the new normal, people are paying less attention to weather, said a 2019 February study based on twitter interactions. People tend to remember weather events only for as long as two to eight years, and if unusual weather continues for longer, they will no longer find it unusual or be able to tell the difference, the study said. This is the fifth story in our series on India’s climate-change hotspots (you can read the first story here, the second here, the third here and the fourth here). The series combines ground reporting with the latest scientific research and explores how people are adapting--or trying--to the changing climate. Boatman Ravi Sahani, 24, scans the Assi ghat, or steps--one of the most popular in Varanasi along the Ganga--for tourists, whom he will offer a 30-minute ride. It is 2 pm. He has been here since 4 am and will remain here till 8 pm, pleading with tourists to take a ride in the boat. The river water is dark and the air smoggy. Tourists complain that the polluted air makes them cough and causes their skin to itch. For Sahani this means reduced income. Ravi Sahani, a boatman in Varanasi, Uttar Pradesh, said fewer people are interested in a boat ride on the Ganga, affecting his only source of income. The river water is dark and the air smoggy. Tourists complain the air makes them cough and causes their skin to itch. Varanasi had no good air day in all of 2015, according to a 2016 report called Varanasi Chokes by the Centre for Environment and Energy Development (CEED), IndiaSpend and Care4Air. “One of the reasons why we chose to study Varanasi was to make a point that the problem of air pollution is not limited to Delhi alone. The need was to take it beyond the national capital,” said Aishwarya Madineni, Bengaluru-based researcher and report’s author. While air quality in high-income countries is improving, nearly 97% of those living in cities--with a population of more than 100,000--in low and middle-income countries are now breathing polluted air. In 2016, the WHO attributed 7 million deaths--comparable to the population of Hyderabad--to indoor and outdoor pollution. Of these, the highest number of deaths, 2.4 million, were in south-east Asia alone. As air quality declines, more people will be at risk of stroke, heart disease, lung cancer as well as chronic and acute respiratory disease, according to the WHO. Cities in Asia, including India, have some of the world’s most polluted air. 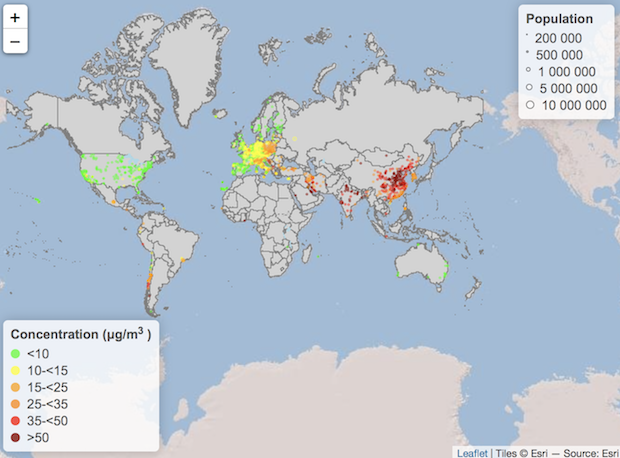 The darker shades represent higher levels of PM 2.5 (particulate matter less than 2.5 µm diameter) in the map above, updated regularly by the WHO. These cities will also be drivers of climate change, experts said. Air pollution can cause a net rise or fall in temperatures and change rainfall patterns, experts said. When something burns, the chemical process of combustion leads to the release of either a gas or particulate matter like soot. In most instances, gases and particulate matter are released together. Scientists said they have a “fair understanding” of the nature of both most gases and particulate matter. “But there are blind spots in our knowledge,” said Schneidemesser of IASS-Potsdam, and it is difficult to say how these chemicals will interact with each other. 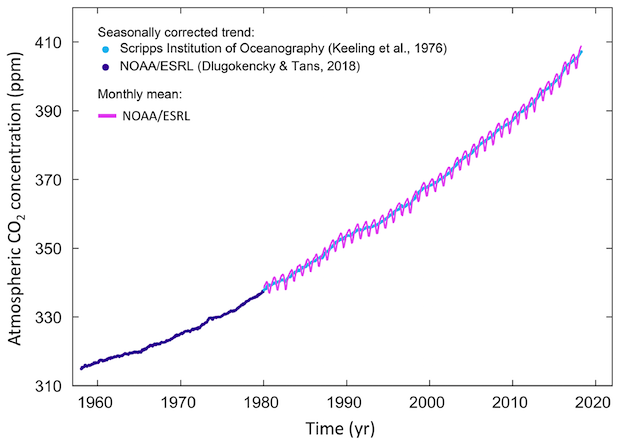 If the particles and gases causing warming dominate the mix, the net result would be a rise in temperature. Particles such as those of dust, sea salt and ash suspended in the air are known as an aerosol. Some aerosols absorb more heat from the sun, others have reflective properties, causing temperatures to drop. “Aerosols can make significant changes to cloud properties,” said Sachchida Nand Tripathi, professor and head, department of civil engineering, Indian Institute of Technology (IIT), Kanpur. He has, for years, studied how air pollution caused changes in local and regional environment. In the clouds, water condenses around particulate matter to form droplets, which then come down as rainfall. Aerosols can weaken rainfall. Here’s how it works: while the water available in the clouds is the same, it is now redistributed among the large number of particles available. But the impact of aerosol pollution on rainfall is a complex mechanism, which depends on moisture availability, amount of pollution and altitude, among other factors. At the local level, this could mean that rainfall might vary greatly within a city. For instance, a highly polluted city centre might receive a sudden, short burst of rainfall that can even lead to flash floods, as Nagpur reported in August 2016. Aerosol pollution can interfere with cloud formation and cause hailstorms, similar to the one reported from Delhi in February 2019. Of the world’s 15 most polluted cities--measured for PM 2.5--13 are Indian. All 13 are in the Indo-Gangetic plain, which stretches from Pakistan in the west to Bangladesh in the east. In 2017, nearly 7% of global carbon emissions came from India, up from 6% in 2016 according to a December 2018 report from the Global Carbon Project, a collaborative effort between several research institutes to quantify global greenhouse-gas emissions. Currently, India is the world’s fourth largest emitter of CO2, behind China, US and the European Union (EU). 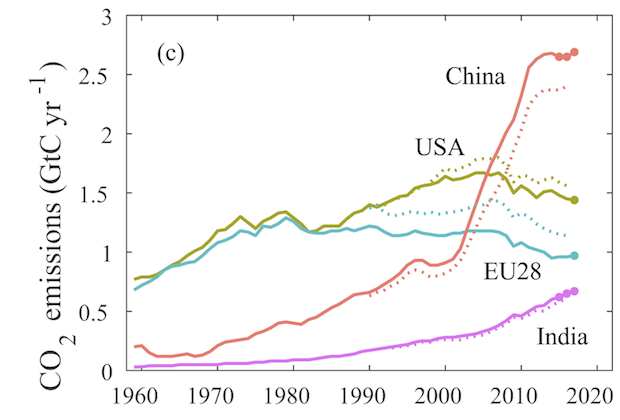 While US and EU emissions are falling, Indian and Chinese are rising. The US continues to have the highest per capita carbon emissions in the world. These emissions come from the burning of fossil fuels or even changes in land-use patterns. Large scale deforestation could lead to a net rise in carbon emissions from a country. Carbon emissions from India and China continue to rise, while those of the US and the EU are declining. The US has the world’s highest per capita carbon emissions. A majority of Indian cities in the top 20 most polluted cities in the world are in the Indo-Gangetic plain. What makes this region, that stretches from Pakistan in the west to Bangladesh in the east, so polluted? Northwesterly winds that blow across the region spread polluted air across the Indo-Gangetic plain. Winds can also spread pollution from Central Asia and Pakistan all the way to parts of Punjab, said Tripathi. The Indo-Gangetic plain is a “global aerosol hotspot”, causing the ice in the Himalayas to melt faster, said a 2011 NASA study. The aerosol is also causing rainfall variability during the summer monsoon, another 2015 study said. But it is not just cities in the Indo-Gangetic plain that are polluted. “There is high pollution around both Mumbai and Hyderabad as well. In the case of Mumbai, due to the topography, the pollution gets carried by the winds to the oceans,” said Sagnik Dey, associate professor at the Centre for Atmospheric Sciences, IIT-Delhi. Dey has studied the distribution of aerosols over India using satellite imagery and found that the distribution changes every season, varying even between neighbourhoods. 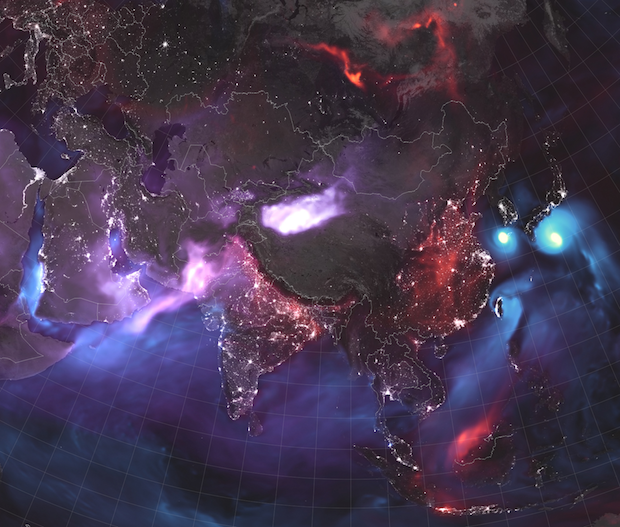 This image from NASA, taken on August 23, 2018, shows aerosol pollution--a mix of particulate matter and gases--over India. The red over the Indo-Gangetic plain in north India indicates aerosol pollution caused by soot, the purple haze over Rajasthan indicates aerosol pollution due to dust from the Thar desert, while the blue specks over northern Gujarat are from aerosol pollution caused by the presence of sea salt in the air. Dey highlights another gap: the lack of air-quality sensors. Back in the Indo-Gangetic plain, the effects of India’s inaction are plainly evident. Baijnath Majhi is 87. He has never gone to school. Like his father, he is a boatman, as are his children and grandchildren. Over his lifetime, Majhi has watched the Ganga’s water get visibly polluted and the air quality in Varanasi deteriorate. Baijnath Majhi said he has seen air and water quality in Varanasi deteriorate over his lifetime. These are changes that should, normally, take hundreds of years, according to experts. For those like Majhi, the polluted air means a worsening quality of life and a cycle of poverty he hasn’t been able to escape. Majhi accepts whatever a tourist is willing to pay. The alternative is day long idleness. Many changes that Majhi has seen over his lifetime tend to play out over a timescale of hundreds of years, said experts. But the sheer quantity of air pollution has meant that those like Majhi are able to notice a perceptible difference. The amount of CO2 in the atmosphere has almost doubled since the pre-industrial age till now, according to the Global Carbon Budget report released in December 2018. Between 1960 and 2017 alone, the amount of CO2 in the atmosphere has gone from 310 ppm (parts per million) to 410 ppm--a rise of over 32%. A lot of this pollution does not come from vehicles in India. “Household pollution in rural India is a big contributor mostly caused when solid fuels like coal or wood is used for cooking,” said Dey. This is a feature common to most developing countries, he added. In Delhi in January 2019, unprecedented air pollution and public pressure led the government to launch the National Clean Air Programme (NCAP)--a five-year plan that focused on improving air quality across 102 cities in India. A key component of this plan is increasing the monitoring of data using low-cost air monitoring devices. “For real change, different departments have to work together; the pollution control board alone will not be able to make much of an impact,” said a senior official at the Ministry of Environment, Forests and Climate Change (MoEFCC), speaking on condition of anonymity since he was not authorised to talk to the media. The NCAP has its flaws: it lacks legal mandate, does not have clear timelines for its action plan, and does not fix accountability. It also ignores air quality in rural India, as IndiaSpend reported in February 2019. Solutions to tackle air pollution exist, but state government officials must lead the way, said the MoEFCC official. “An increase in public pressure is needed to drive change,” he added. Coordination between government departments to address air pollution is another requirement. In Varanasi, for instance, the civic body in charge of making regulations rarely consults the pollution control board. Dey of IIT-Delhi believes that while the NCAP is “heading in the right direction”, it is not enough. “We need to invest a lot more in measuring the data,” he said. Measuring air pollution and climate-change impacts is difficult, said IASS-Potsdam’s Schneidemesser, because “there are so many interactions and feedback mechanisms” between air, land and ocean systems. But on the bright side, “if regulations are put in place, it is possible to see improvements in air quality on the timescale of weeks and at times even days”, she said, citing the example of Beijing--a city where the minimum temperature falls to -8 deg C-- where air pollution was brought down by 35% over five years to 2017. Beijing’s transformation was possible because the government had a plan, various departments enforced the plan and the laws and helped millions of households switch from coal to natural gas for winter indoor heating. In Varanasi, it would be a start if government officials started talking to their colleagues. This is the fifth of a series on India’s climate change hotspots. You can read the first part here, the second here, the third here and the fourth here. Republished with the permission of IndiaSpend. You can read the original article here.